We were lucky enough to have University student Nathanael Winckel with us for a 12 week University work placement. Nathanael was keen to learn more about Unity so when we told him that we had just developed a Unity plugin, he was pretty keen to give this a go. Who wouldn’t want to make a game that can be viewed and played in true 3D? Nathanael’s final take on the Unity plugin was “that if you can create a game or scene in Unity, then it’s pretty simple to create something for the VX1”. Here’s a little around the game he created for our 3D volumetric display, the Voxon VX1. We dubbed it ‘Space Out’ as it was a little like Space Invaders and a little like Breakout, so yes, it has a real retro feel! An interview with Nathanael Winckel about his University placement at Voxon Photonics. I was searching for a placement position where I would be able to do some programming and when I found out about Voxon Photonics, it sounded perfect. The holographic display was like nothing I’d ever seen before. Until I got here I didn’t even know we had the technology to make something like that. Q3: What did you expect your work experience would be like a Voxon Photonics? Wasn’t sure what to expect when I got here. I hoped I’d be able to develop my coding, gain some new skills and leave an impact on Voxon Photonics in some shape or form. Q4: What did you enjoy about doing a work placement at Voxon Photonics? Being able to see holograms come to life. 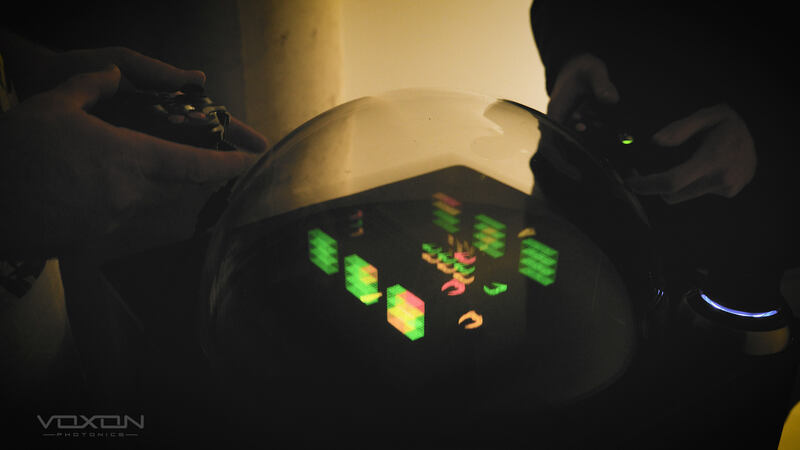 The opportunity to work with the VX1 and see the game I made displayed as a 3D hologram. The fun, passionate people working here. It was amazing to see an object displayed in a three-dimensional space from multiple different angles. You could really see how the holograms from Star Wars influenced the design of the VX. It’s a fantastic way of displaying things like nothing else around right now. How to use the Unity game development engine. What working in a team can be like in the real world. What working with new technology can be like. A small team, working together towards a common goal. One where I can see the results of short term goals and look towards long term goals.